The judge began the hearing by discussing his ruling on the prosecution’s motion in limine to ensure the admissibility of co-conspirator statements at trial. In his 9-page order, the judge found that the state had demonstrated the existence of a conspiracy by a preponderance of the evidence. Therefore, he would permit the co-conspirator statements to be used against each defendant and for each of their statements to be used against the other co-defendants at trial. In light of this decision, Thomas Durkin from the defense team immediately said that they would need to file for a severance of the counts so that the terrorism counts could be tried separately. The judge said that the case law he had reviewed showed that a conspiracy charge was not required to consider whether the co-conspirator statements could be used or not and that the statements could be admitted for any criminal charge and then used at trial to prove any other charge as well. However, that does not mean that the state can prove all the charges beyond a reasonable doubt, even though he considered there to be evidence of several crimes that a reasonable trier of fact [i.e., a jury member] could examine to find a conspiracy to commit arson and maybe a conspiracy to commit terrorism. The defense responded by reminding the court that they are on trial for a conspiracy count that has never been tried before and that he has found that the count is constitutional on its face, so trying that charge with all the others would put them in a difficult due process scenario. In turn, the judge said that he would allow the statements to be used regardless of the order in which the charges were tried. He also told the defense that they could appeal his decision if they liked and that he was denying their motion to sever the counts based on their oral arguments but they could file a motion if they liked. Molly Armour from the defense team then reminded the judge that Brent Betterly never encountered the undercover cops on May 1st, 2012, did not recruit others to join any conspiracy, and did not do other things the prosecution has alleged about all three defendants. The judge said he had covered that issue in his order. His first thought was to deny the state’s motion on that aspect without prejudice [meaning it could be brought up again later] because the state did not lay out precisely the source of the statements. He was concerned about that aspect and thought he might want the state to re-do that section, but first he looked at the non-hearsay portions of the evidence submitted to him to see if he could make a decision based on that. He had the transcripts and could see that not all the defendants were present at all times and Armour has made clear that Betterly was not there for all of it. However, the case law says that a defendant does not have to be part of every interaction, as someone could be at the center of the conspiracy or come in later on. 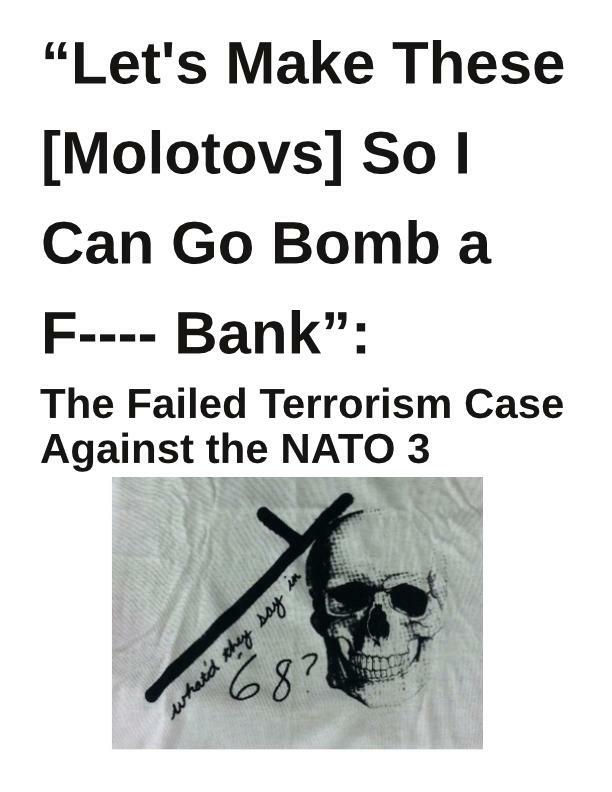 When taking the state’s proffer as true for the sake of considering their motion, it was clear that there was some contact between Betterly and his co-defendants and clear beyond a doubt that he was involved in a conspiracy to create Molotovs, which is clearly illegal. Armour responded that they have a unique situation since the state is alleging that the conspiracy began with comments between Betterly and Brian Jacob Church on Facebook on April 19, 2012 about going to Chicago. The judge responded that he had not considered the portions with statements from Facebook posts because he did not know who was at the computer and typed the words, although he does know that there was a conversation on Facebook and he considered that. Armour replied that the timing of alleged events was a problem, to which the judge responded that it was a problem for the proof at trial, not for this motion. Armour then stated that his order referred to the group as a whole even though the judge recognizes that Betterly was not present for all the alleged events. The judge said he assumed that not all the defendants were there each time and that was troubling to him, but not necessary for this ruling. Armour also argued that the state was unclear on what they were saying about each aspect of the charges and that they need to show a prima facie case to have the co-conspirator statements be admissible, not use conspiratorial language to prove there was a conspiracy. The judge then said that he had issued his ruling and they could file additional motions if they liked. The judge said that he had reviewed the prosecution’s and defense’s trial memorandums and would use the state’s agreed statement of facts, as what the defense had written was not what he was looking for. He also told the state to add in at the end of the statement of facts that each defendant had pleaded not guilty to each of the charges. The defense asked the judge what was wrong with their statement of facts and the judge said that this statement was not meant to indoctrinate the jury and that what the state wrote was more in line with the template to be used to guide these statements. The judge also commented that he still did not know if the state was going to dismiss any of the charges. The prosecutors said they did not yet have authority to dismiss any of the charges, but would let the judge know. Michael Deutsch of the defense team asked what that meant and the judge said that he believed it meant that Anita Alvarez [the Cook County State’s Attorney] had not said so yet. The prosecutors added that the trial was still a month out and they did not know. The judge then asked the defense to confirm that Betterly and Church were still only asserting an affirmative defense for counts 10 and 11 [the unlawful use of a weapon charges], which the defense verified. Armour said that they had laid out the information for Betterly in their trial brief. The judge also confirmed with the defense that Jared Chase would be using an entrapment defense on all counts. The judge said that the state had told him that the defense would not stipulate to anything and that the defense had told him that the state had not offered them any stipulations. Thus, he told the state to start typing up stipulations for the defense, to which they replied that they were working on it. Durkin said that they had already said they would stipulate to almost anything regarding the authentication of some electronic evidence. The state said that their understanding was that one of the defendants was not going to stipulate to anything, so it would be best if they could stipulate and not have to deal with foundational witnesses. Armour said that Betterly does not want to admit to anything. Durkin said that if there’s a chain of custody issue, that Chase would stipulate as long as there was testimony. The state then said they would start drafting stipulations for that, but that if the defense then started arguing that the evidence was not true, they would have problems. The judge replied that arguing that the evidence is not true or what it means is not the same thing as arguing about how it was handled. The judge said that the defense still needed to give identifiers of potential witnesses to the state, to which the defense replied that they still had not received the addresses of everyone on the state’s witness lists. The judge also asked the state if they had narrowed down their list of potential police witnesses, to which the state replied that they had narrowed that list down some but needed to do so more. The judge said they would need to do the same for their non-police witnesses. Armour reminded the court that their trial briefs were due on November 26th and that the state should have had their list to the defense a long time ago and that the state’s delay was hampering their preparations. The judge then turned to the defense’s list, noting that there were several Secret Service agents listed and he imagined that they were mentioned in the discovery somewhere. Joshua Herman, one of the lawyers for Chase, said that the agents were mentioned in discovery pages #7448–7473, which covered a number of emails between Secret Service agents and Chicago Police Department officers and state’s attorneys regarding the state’s letter requesting discoverable materials. The judge asked if the state had taken steps to secure those witnesses and told them to get a move on when they said they had not. The state replied that securing the witnesses was not their burden. Durkin then responded that there had been a joint investigation so they should be able to make the agents available. One of the prosecutors then replied that he had drafted the discovery request letter and that the agent in the email exchange was not a witness. The state had not given the defense any evidence from the Secret Service because they did not receive any, so they would never call the agent as a witness. Durkin replied that they were sending letters to the witnesses today according to the appropriate process to try to get them to testify. They did not want to tie up the agents and assumed that some of the evidence would come out through cross-examination, but they issued the subpoenas to be sure. The judge then asked about a retired United States Army doctor on the defense list. Michael Deutsch, one of the lawyers for Church, said that he is an expert on explosives and that they would provide the state with a curriculum vitae for the doctor, but they would not know if they would call witnesses until the evidence comes in at trial. The judge said that he only cared about who the experts are, that they would follow the rules for calling witnesses, and that if there is not appropriate disclosure then the witnesses would not testify. The judge also asked about Chicago Mayor Rahm Emanuel being on the defense’s witness list and if they had a proffer on what he would testify about. Durkin said that Emanuel was being subpoenaed because he may be a witness who would show that the defendants did not influence a significant portion of the population and that he is the best witness to talk about that. He was not sure how the state was going to prove the terrorism charge, but Emanuel had a hands-on approach to the security planning for NATO, preparing for the summit, and dealing with the finances. Their subpoena asks for documents as well as testimony and would be sent out tonight. Deutsch added that Church was alleged to have attempted to fire an arrow at the Mayor’s house so Emanuel could testify about whether he knew about this alleged plan, what kind of windows he has, and other matters. Durkin added that they had subpoenaed four city officials and had good faith purposes for calling them, not to embarrass or harass them. He also said that it was possible that someone else could testify instead of the Mayor. The judge then asked about paragraphs R and S, regarding representatives from the NATO host committee. Durkin said that the host committee was a public/private partner and that he was hoping that a lot of the information he was looking for from these witnesses would come out in cross-examination. Deutsch then returned the judge’s attention to the state’s witness list, saying there were several civilian witnesses without identifiers and that there were not reports in discovery that he knew of that showed the witnesses on pages 3 and 4 of the state’s list. The judge said this was why the defense needed to bring these issues to his attention and then asked about [several names redacted]. The prosecutors asserted that page 3 listed city employees and page 4 listed people who had associations with the defendants prior to their arrest, one of which was a prisoner [name redacted] at Cook County Jail who had contact with two of the defendants. All of this was provided in discovery, the prosecutors asserted. The judge made the prosecutors assert on the record that they had provided the defense with the witnesses’ last known addresses. The prosecutors also said they would not be using the testimony of the other prisoner. The judge then moved on to the exhibit lists, asking the defense if they had looked at the state’s list. Deutsch replied that they had but that it looked like an inventory of the discovery. The prosecutors said that they would have all the evidence ready and in the courthouse prior to the trial and that all the evidence had been tendered, copied, or made available to the defense. They said that they did not want to leave anything off the list and not be ready. The defense then asserted that there are cameras and computers in discovery that do not belong to the defendants and were irrelevant. Also, the defense said that if the state had gone through the list just once, they could have reduced it by 60–70%, but they had not done that. The judge replied that these were disputed legal issues and then moved to the next topic. Deutsch talked about a pipe in discovery that was alleged to be part of a mortar gun and that was cut into several pieces before the defense had ever seen it in its original form. The judge asked if the state could glue it back together, to which the prosecutors said the defense could argue the weight of this evidence at trial but it is not a pre-trial issue. Deutsch countered that the state had altered the evidence so it is a legal issue. The state replied that they could not examine some evidence because it was too dangerous to bring into their offices. The judge then asked how they would bring it into court if that were the case. Deutsch then said that there are potentially three pieces of evidence that had been altered: the pipe, alleged black powder that they have never seen, and the Molotov cocktails since the bottles have been changed and the gasoline taken out. The state argued that the defense had never asked to view these items until then and that, while the pipe was no longer dangerous, they had never received a request from the defense to view the mortar. Deutsch responded that they had made the request when they looked at certain things that the state did not open, namely the black powder, pipe, and beer bottles. He also said that the state had told them that they would consider letting the defense see the materials if they could find their own lab. The judge said that someone has to see it if it were to be admissible. The prosecutors then reiterated that they did not remember a request but that, to the best of their recollection, the state’s lab had refused to open some evidence because it was too dangerous and the issue stalled there. Deutsch then said that if the state got the altered evidence to their office, they would inspect it and decide whether to stipulate or file a motion. The state agreed to this approach. Durkin then said that it seemed to him that the evidence was either spoiled or not, and that he was not sure how the state would be able to authenticate this evidence. Deutsch added that the court would need to decide whether it is spoiled or not before trial. The judge replied that there are many remedies available, including not allowing the evidence in or instructing the jury on it. The defense then said, for the sake of this conversation, if they were to assume there were Molotovs, then where are the wicks and the gas? The judge said there needed to be more of an argument to show that it was spoliation rather than making the materials safe. However, he was not sure about the pipe and asked if was cut to be made safe or to test it. He also asked if a notice had been given tot he defense about spoiling the evidence. He also said he did not know whether the jury would need to be instructed that the defense had not been given an opportunity to inspect the evidence but that he was only ordering that the evidence be made available for the defense to inspect. The state said it would make the evidence available. Deutsch moved on to the next issue. The defense did not know which sections of the tapes of audio recordings the state wants to put in so they do not know if there are audibility issues. The judge said that as long as the tapes are not totally inaudible, the state can play it and the jury can listen. Whether there will be a transcript and whether the transcript will go back to the jury are separate matters. Additionally, if the defense thought the transcripts were off, they could submit their own transcripts and there could be dueling transcripts. Deutsch then reminded the judge that they still did not have the transcripts from the state. The prosecutors then said that they would identify and submit to the defense the universe of transcripts by the middle of next week, two weeks before the jury would be selected. Once the defense knows what their universe is, the prosecutors argued, they can tell them what the problems are if they have any and they can resolve the issue before the jury is selected. Additionally, if anything unanticipated occurred, they could handle that outside the presence of the jury. Durkin asked if they were going to get complete transcripts, to which the state said they were not transcribing all the recordings. The judge said that if the defense felt that completeness was an issue, they could ask the prosecutors for transcripts or create them themselves. Durkin said that he was worried about having time to submit a completeness issue to them before trial. The state said that they would never use Church’s post-arrest statement, no matter what. The state said that, since they will not be in a hardwired courtroom, they will roll in a TV so the jury can see photos and that they would not be showing videos. The judge said that he anticipated having a dress rehearsal for the trial on January 9th or 10th. The prosecutors also said there would be hook ups for the defense’s laptops and that there would be an ELMO [a type of projector] for both sides to use. The judge also affirmed that he had been told that they would be in a larger courtroom for trial, but not the hardwired one, and that jury selection would be in his usual courtroom. The next hearing was set for Thursday, December 19th at 2pm to talk about the jury instructions, jury questionnaire, and other matters.